Today was our second trip into Rocky Mountain National Park and I’m glad we had the opportunity to see it from another angle. We took the Old Fall River Road, which was the first auto route in the park. It’s 11-miles of primarily gravel road, one-way only, obviously intended to be driven slowly and savored. The views are spectacular, winding through switchbacks (without guard rails) that overlook steep canyons. Although a road from the 1920’s, narrow and curvy, it is suitable for driving without a four-wheel drive vehicle. We never had the illusion of being the only ones on the road. The Rocky Mountain National Park was busy due to it being a free park day. But with plenty of pull-out areas, we took our time and let those in a hurry pass us by. We were rewarded with a peaceful day, great views, and interesting photo ops. 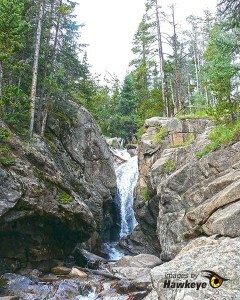 Our first stop was Chasm Falls, just a short hike from the road. I found the alpine tundra to be the most fascinating part of the day. Alpine tundra is land above the trees, beginning at about 11,000 feet. Plants growing here are easily damaged by foot traffic, and then erosion kicks in as the soil is whisked away by the wind, so it’s important to stay on the trails. Although it’s very cold and windy here, we found the tiniest, delicate-looking flowers and even spotted a hummingbird. Old Fall River Road ends at the Alpine Visitor Center (elevation 11,796′). It was a good spot to have our lunch: a Paleo chop salad for me and a chicken sandwich for Jerry. The only downside was that the people next to us chose that moment to light their cigarettes. Why must our enjoyment of lunch in the crisp, clean mountain air be interrupted by the foul, headache-inducing smell of cigarettes? We drove on after lunch, turning back after visiting the Continental Divide – another beautiful view. 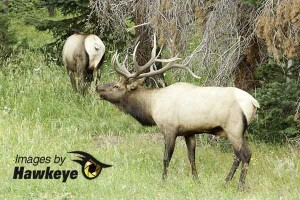 On our return trip, we photographed Big Horn Sheep, Pica’s and Elk. I heard a beautiful bull elk bugle to his herd that it was time to move on. That was a first. The best part of our full-time RV lifestyle is that we can move on whenever we’re ready. So tomorrow will mark our last full day at the Loveland RV Resort. We had planned to stay in Colorado longer and though we’ve enjoyed it here, we’re ready to move on. Our next stop will be near Custer, South Dakota.